Chocolate and Strawberry are one of the most popular flavor combinations, and rightfully so. The flavors can be made into just about any dessert you can think of – cakes, cupcakes, pies, cookies and more. 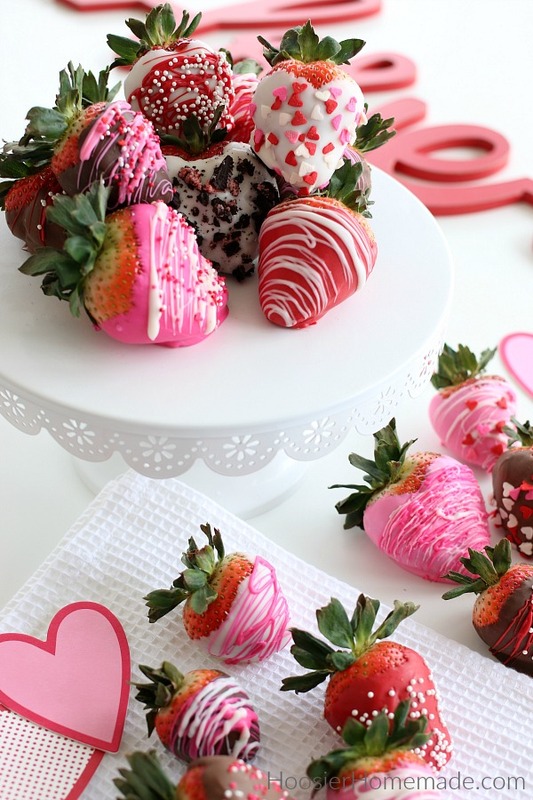 And the ideas are endless for using Chocolate Dipped Strawberries on top of the desserts. They are easy to make, but look really impressive, like you spent all day. Making the Chocolate Dipped Strawberries is also fun for the kids and a great way to build lasting memories. The kids will be so excited to make a batch of these chocolate strawberries for their Teachers, Grandparents, a Family Friend, or Babysitter. The melted chocolate can get hot, so be sure to help with that, but they can easily add the toppings and sprinkles. 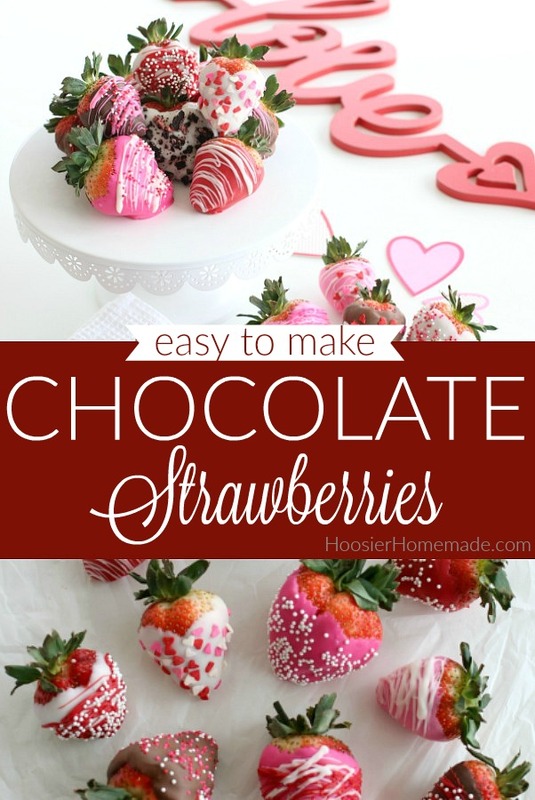 While Chocolate Covered Strawberries are definitely easy to make, there are a few helpful tips that will make it even easier. Baker’s Tip #1 – Have all your ingredients and toppings ready to go. Anytime you work with melted chocolate, it’s best to have everything ready because the chocolate can harden quickly. Baker’s Tip #3 – Strawberries are in peak season from late April through June, depending on your area of the country. However, you can easily buy strawberries anytime at your local grocery store. When choosing the strawberries, be sure they are firm and really ripe, you don’t want them mushy because they will be hard to work with and won’t taste good after the chocolate is added. Add chocolate to microwave safe bowl. The amount will depend on how many strawberries you are coating. Typically 3-4 chunks of Almond Bark is a good place to start. You don’t want a lot because it can get hard quickly. 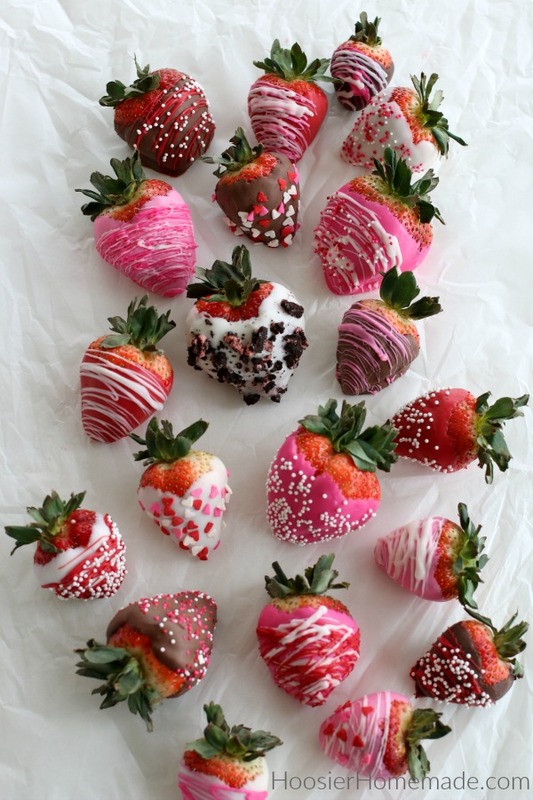 However, you want enough so that the strawberries can easily be dipped and coated. Microwave Almond Bark starting with 1 minute. Then stir. Heat for 30 second intervals, stirring after each time. You want small pieces of unmelted chocolate in the bowl, then stir the chocolate until it’s completely melted. The reason for this is to prevent the chocolate from burning. Dip strawberries in melted chocolate and immediately add sprinkles or toppings. For drizzling the chocolate, melt in microwave then use either a spoon, fork or plastic squeeze bottle to drizzle melted chocolate. After the strawberries are all done, set them aside to harden. This should take only 5-10 minutes, at the most. Use the chocolate strawberries on the same day you make them. The strawberries can begin to weep and become sticky. 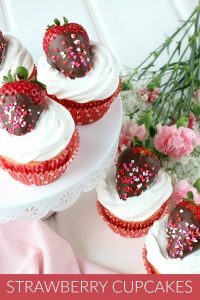 If you give the chocolate dipped strawberries as a gift, be sure to add them to a cupcake liner or a piece of parchment paper to keep them being sticky. You can add them to small gift boxes for teachers, neighbors, friends and more. Or even add them to a gift basket for the man in your life. 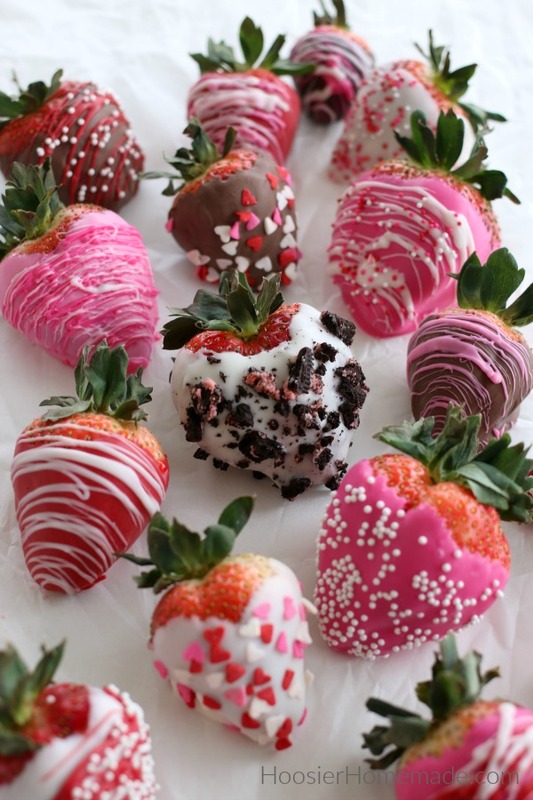 You can also make Chocolate Covered Strawberries for birthday’s, 4th of July celebration, Christmas – really any time. 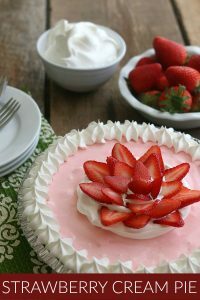 Looking for more recipes with Strawberries? Click on the photo for the recipe! 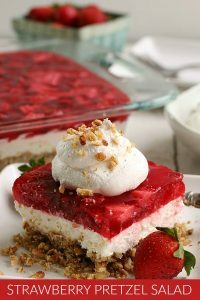 Easy to make decadent treat that everyone will love. Oh you tease! Those berries couldn’t be prettier. YUUUMMMM-OOOOOOOOO! These strawberries are absolutely beautiful. I have done chocolate covered strawberries a number of times but will have to remember how to make them this appetizing. Thanks for the tutorial! 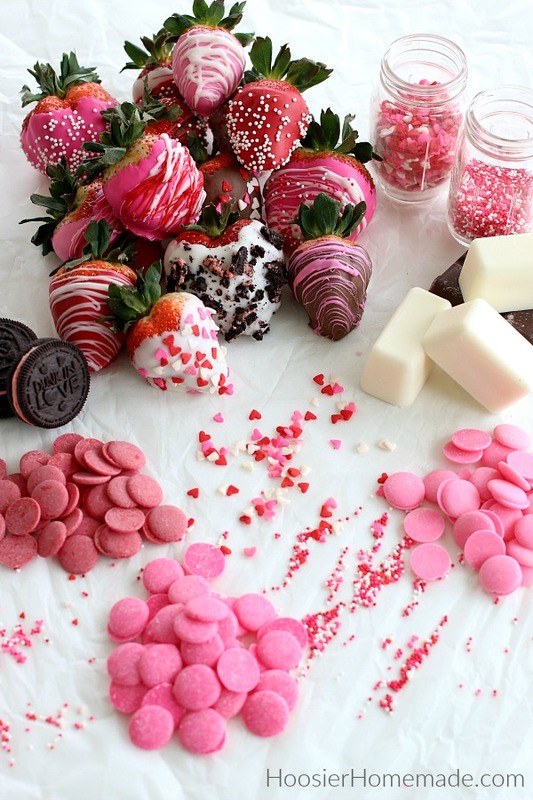 What perfect Valentine’s Day treats…yum, yum! Love these! I bought some at the grocery store last night – 6 stawberries for $9.00 – the kids devoured them. 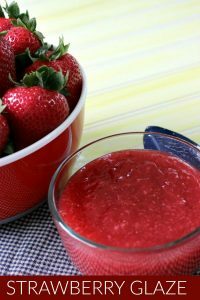 I’m going to stop by and purchase some plain strawberries tonight since I already have the other ingredients and make some myself! Thanks for sharing this post and information! Happy Valentine’s day!